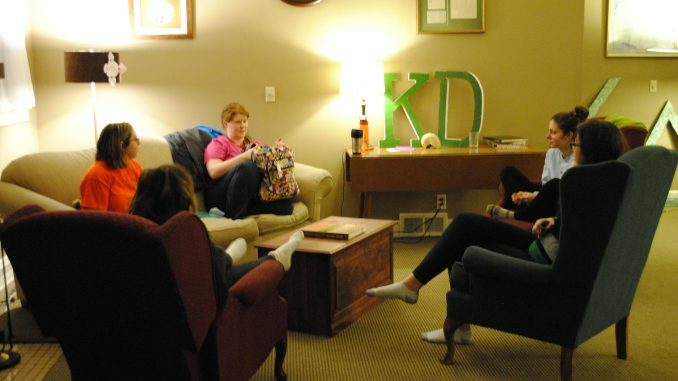 The Albion College Greek system is something truly unique – just over 50 percent of the student population participates, while encompassing a wider range of personalities than the stereotypical fraternity and sorority profile. Within the last few weeks, Albion Greeks have done even more to differentiate themselves. Three weeks ago, a small group of students came up with the idea of a weekly group bible study for the Greek community. They wanted a chance for Greek men and women to also have the opportunity to worship and learn about scripture in a space more comfortable to them. The initial idea came from Jacqueline Nowak, Comstock Park junior, a member of Intervarsity, Albion College’s student-led Christian fellowship group. Nowak spread the idea to her friends in the Greek community to get started. Dana Brooks, Wooster, Ohio, senior, and Jessica Sholl, Jerome junior, got the ball rolling. The average turnout has been about 10 to 15 students, with numbers increasing each time. Apart from reading scripture passages, the group also exists as a support system for students to come and talk about their problems if they so choose. Brooks’ desire is to emphasize a relaxed and pressure free atmosphere for the new Greek bible study. This happened during the spring 2012 semester as well through one AXO, one KAO, and some ATO students. It met weekly in ATO’S basement.